Liv’s 3F Design Philosophy means BeLiv is engineered to be a truly women’s-specific ride. It’s the coolest looking commuter bike that’s also perfect for fitness rides on paved or dirt roads. 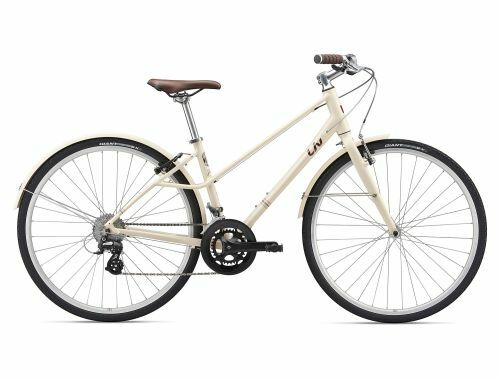 Ride in style with this confidence- inspiring, fashionable bike that allows you to take your next adventure through and beyond the city. Wide, reliable tires resist punctures and tackle road debris and gravel, no problem. The step-through design with a split downtube offers comfort while standing over the bike, and adds some fun-flair to the outlook. The flat handlebar offers confidence and comfort while navigating in style.